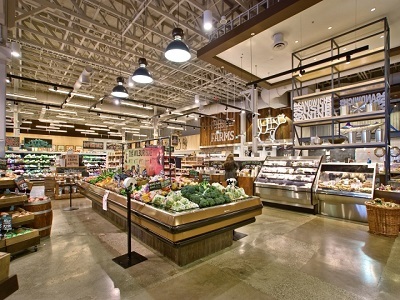 The Fresh St. Farms store by King Retail Solutions, Canada, a unique combination of design and decor. 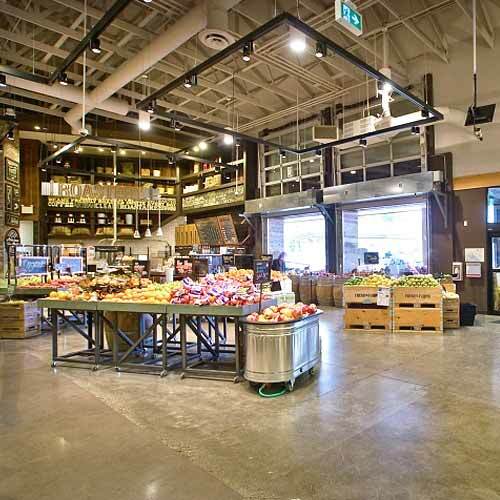 Designed by King Retail Solutions, Fresh St. Farms Store in Surrey, Canada, is a unique amalgamation of authentic decor and traditional design. The design is inspired by a farmer’s market. 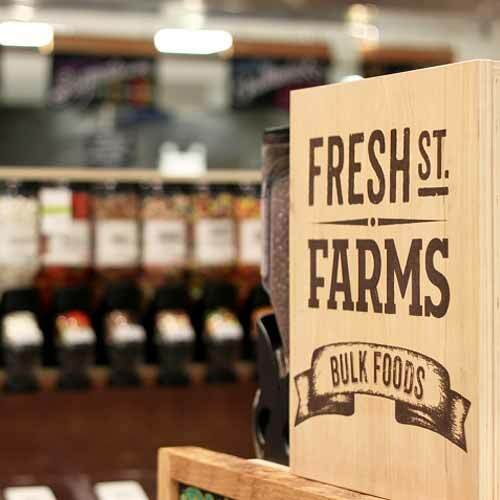 The store is small, about 1/3 the size of an average grocery store. 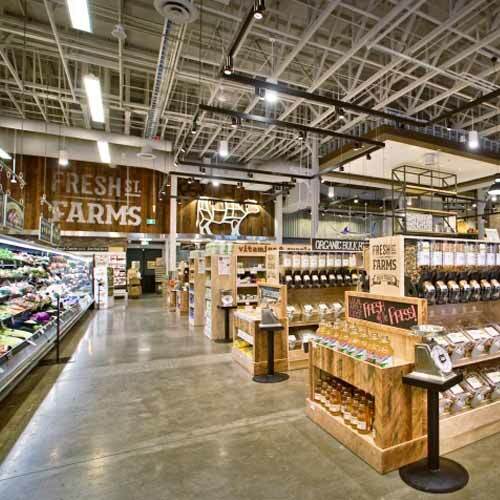 The motive was to create a modern farmers market experience, with all essentials of a local grocery store. 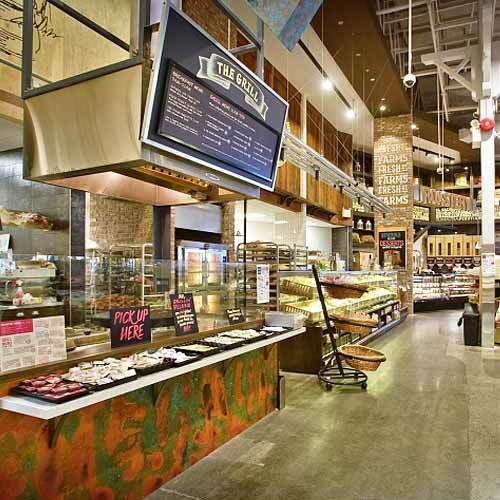 Décor and imagery are harnessed to serve as directional signage often in the place of large text signs. 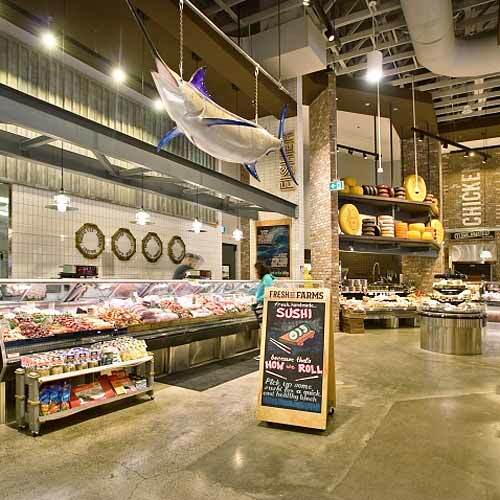 For example, impact pieces such as massive cheese wheels and a hand-painted trophy marlin adds to the charm of the store, and intuitively guides the shoppers. The store plan is open such that from any spot within the store there is a clear field of vision, and easy footpath to all other departments. Besides, a working fireplace adds warmth to the café seating area. What’s more, the store uses classic urban materials: real sliced brick, subway tile, reclaimed local wood, a small boutique coffee roaster that roasts, in-store, over 50 pounds of coffee a week, décor touches such as paper-thin mottled copper siding, and concrete floors that are dug through, trenched, filled, cracked, polished and sealed. Furthermore, savvy use of fauxed materials includes buck-shot and burnt directional posters in frozen foods department as well as wide-rib exterior siding.